Would Icelandic Scribes Have Illuminated A Block O With Crowberry Ink? 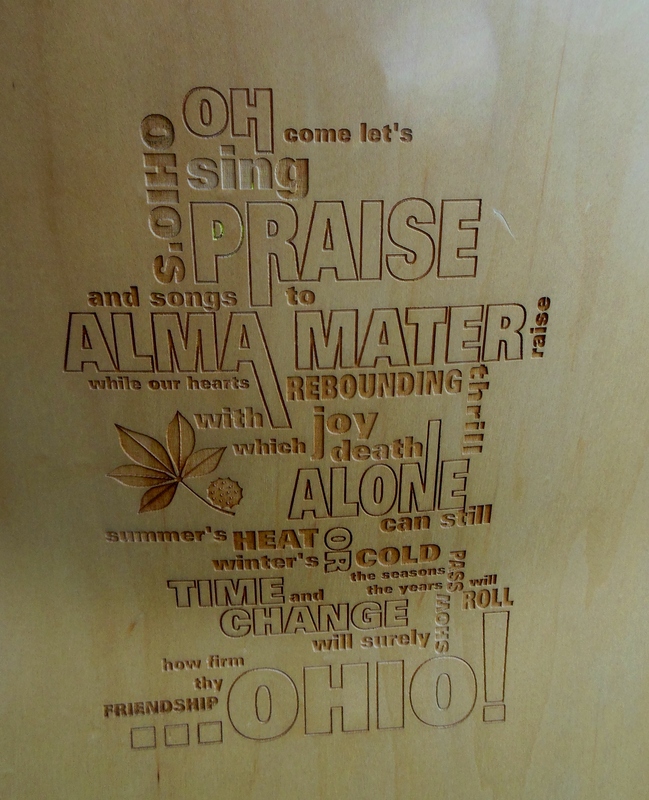 Spend a few hours at The Ohio State University’s Ohio Union and you’ll find Script Ohio tiles in restrooms, the Block O on floors and “Carmen Ohio” lyrics carved on chair backs. Meeting rooms showcase memorabilia associated with student service organizations like Ohio Staters, Inc., which sells seat cushions outside Ohio Stadium on home football game Saturdays and provides brochures of “Buckeye Stroll,” a self-guided historical campus walking tour. In this scarlet and gray paradise, I also discovered that the people of Iceland created something even more beautiful than the Lopapeysa, the iconic Icelandic sweater with a patterned circular yoke that’s knit with lopi, the wool of Icelandic sheep. 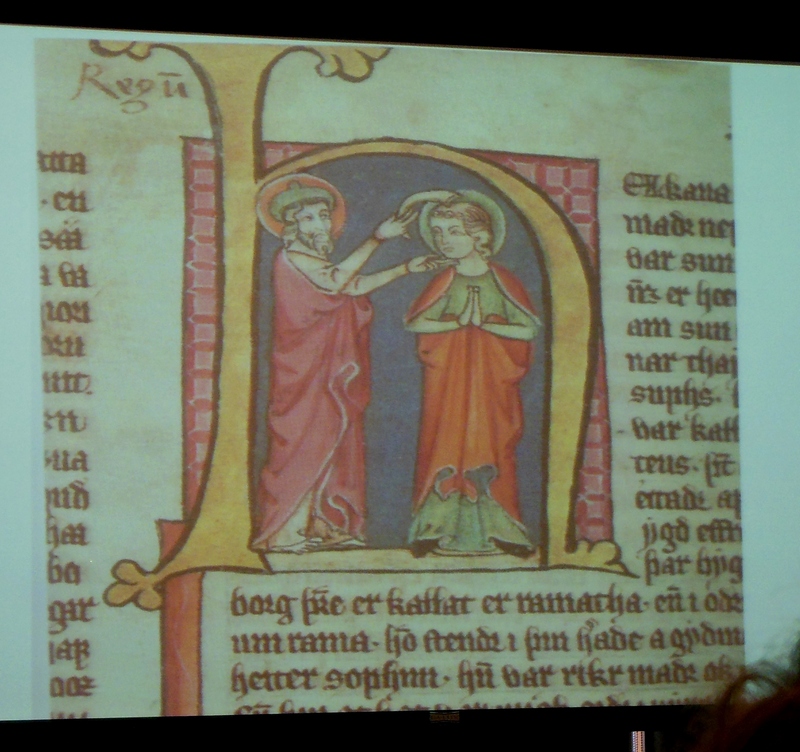 The beautiful Medieval manuscripts that Icelanders produced are the subject of research by scholars like Elizabeth Ashman Rowe, a lecturer in Scandinavian history at the University of Cambridge. Rowe introduced fellow scholars to these remarkable documents during this month’s Texts and Contexts, an annual conference at Ohio State that is devoted to Medieval and Renaissance manuscripts, incunables and early printed texts in Latin and the vernacular languages. The conference explored recent scholarly research in epigraphy (the study of inscriptions), palaeography (the study of ancient and historical handwriting), and glosses (annotations written on the margins of a manuscript that explain or comment on the text). After Christianity brought writing to Iceland in the 11th century, the bishoprics, monasteries and nunneries of medieval Iceland became active centers of learning and book production. In their scriptoria, scribes copied, translated and adapted religious books like Bibles and lives of the saints into vernacular language. Some of the earliest examples of Icelandic manuscripts are a circa-1100 Easter table that was used for keeping track of eclipses and volcanic eruptions in Iceland and a circa-1300 plan of Jerusalem. It was expensive to produce manuscripts in Iceland because the vellum on which they were written came from cattle. Since cattle had to be kept in barns during the cold Icelandic winter, farmers figured how much hay they had and how many cattle they could maintain, then killed the rest of their herd. The hides of some of those cattle became vellum for writing. Since there was no lime in volcanic Icelandic in which to soak the skin, ammonia was used instead, resulting in darker vellum. Decorated initials in illuminated manuscripts helped readers keep track of their place or find a passage, such as in the Codex Regius of Icelandic laws circa 1250. 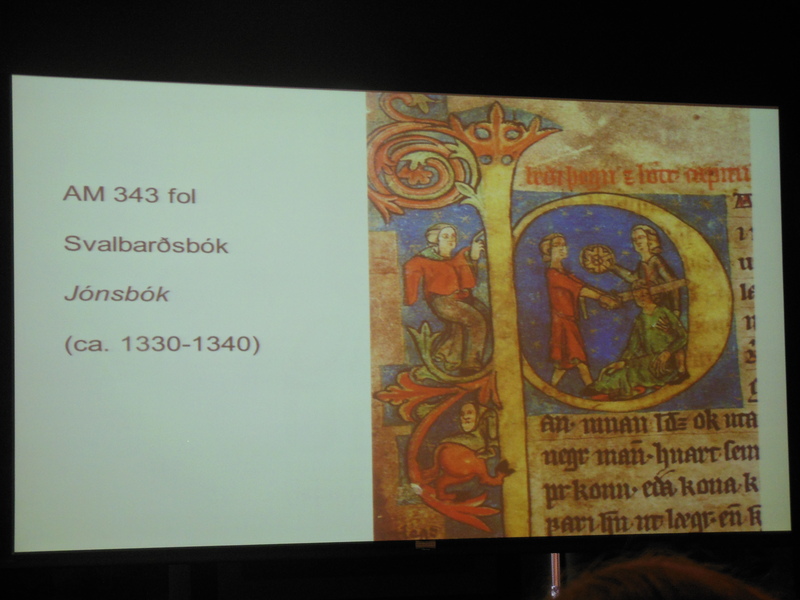 They also provided clues to what a section of the work was about, like a decorated initial in the circa-1330 Jónsbók that depicts manslaughter. The Flateyjarbók, an important late 14th-century Icelandic manuscript, is a collection of sagas of the Norse kings. This illustration shows the martyrdom of St. Olaf, who encouraged the conversion of Norway and Iceland. Icelandic scribes illumined their work with ink made from crowberries native to Iceland and imported plant dyes and minerals. They derived their inspiration not only from pattern books of chivalric and religious illustrations, but also from design motifs seen on carved doors and liturgical vestments. 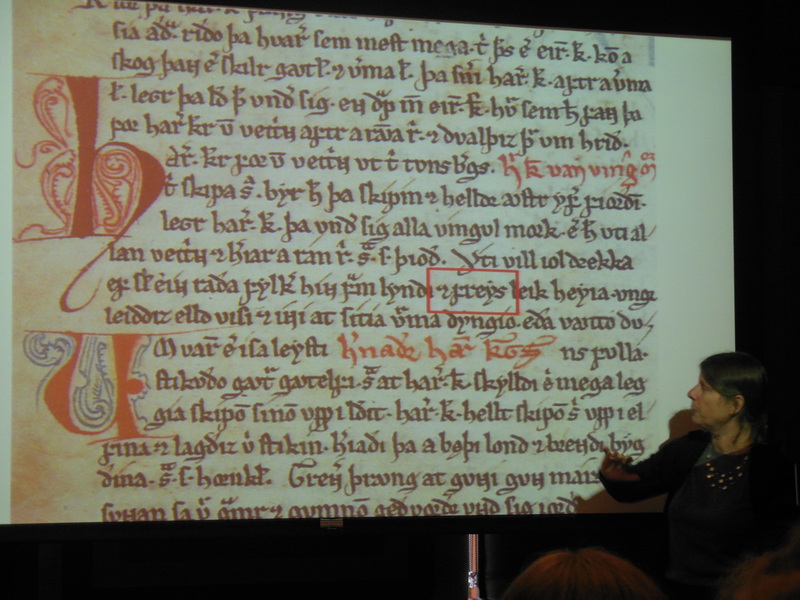 Rowe also led a workshop introducing participants to medieval Icelandic palaeography. She explained how to interpret the abbreviations that scribes used to write more quickly and save space, and how to recognize individual letter forms, ligatures and styles of handwriting in order to read and understand the text. 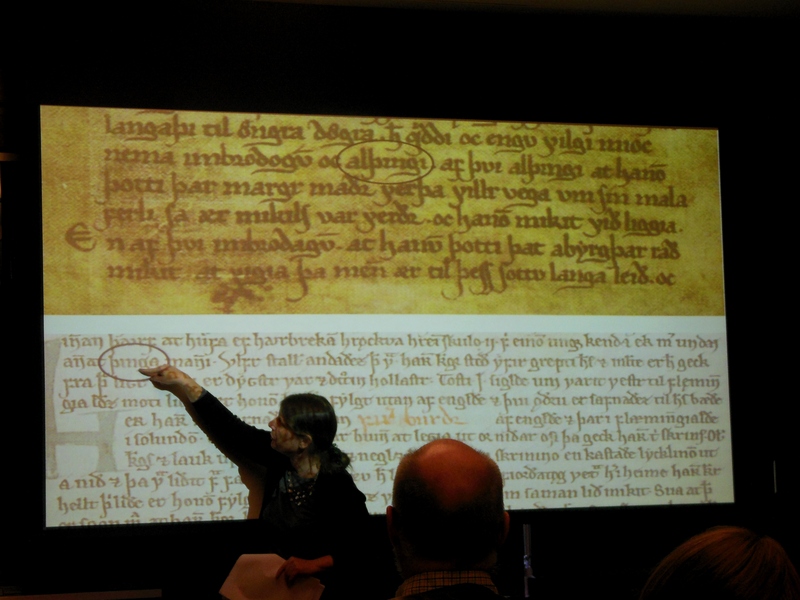 Four different types of script exist in medieval Icelandic writings. Carolingian, developed in the 11th century and named after Charlemagne, became the dominant form of writing in Europe until the first half of the 13th century. In time, Carolingian script became more compressed, with letters becoming thinner, taller and written more closely together. Later, Protogothic script came into favor, followed by a formal Gothic cursive that came to Iceland in the 14th century. Since the Icelandic language called for special letters for sounds that Latin didn’t provide, some script forms are distinctly Icelandic. Rowe observed that the development of script reflected changes in medieval architecture. Rounded Romanesque arches are like round Carolingian letters, while taller, more slender letters of Gothic script reflect Gothic arches. Workshop participants tried their hand at identifying abbreviations developed and used in medieval Iceland, then following the conventions of transcription to document choices about capitalization, punctuation and word spacing in deciphering marginal notes, missing words or letters, illegible letters, text above the line and expanding abbreviations. 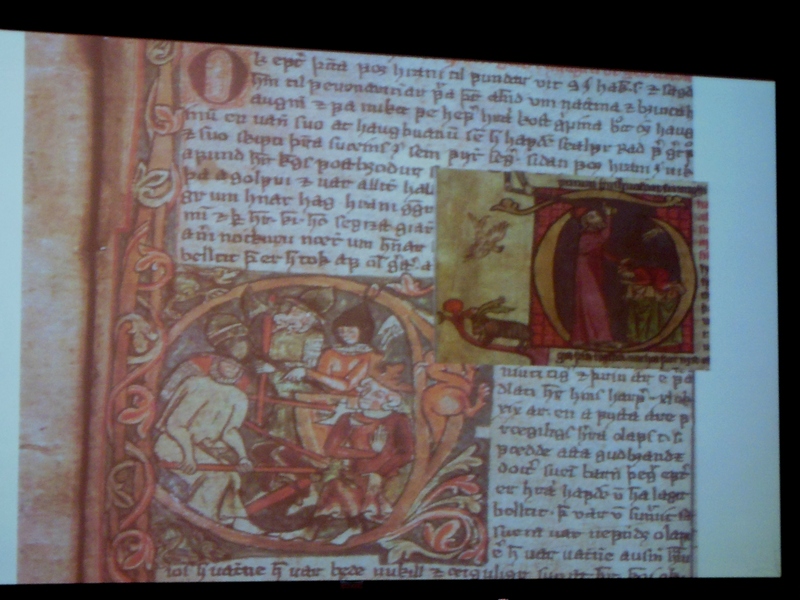 In a subsequent conference session, Rowe shared passages from Icelandic books of annals, such as the annals of Einar Haflidason, a 14th-century Icelandic priest. In these works, scribes used a combination of scripts, employing large writing to indicate the importance of people and church events and a display script to begin the first line of a chapter of a saga. 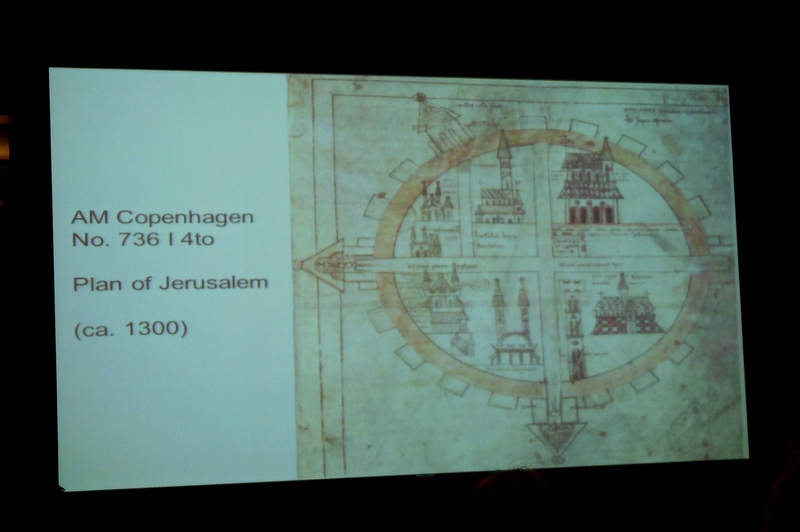 She also shared examples of digitized Icelandic manuscripts that are collected at http://handrit.is/, http://www.handritinheima.is/ and http://haandskrift.ku.dk/. Other Texts and Contexts conference sessions focused on manuscripts produced at the scriptorium at Gembloux, a Benedictine abbey in Namur, Belgium, and the famous Benedictine monastery at Monte Cassino, Italy. Maria Dobozy, professor of languages and literature at the University of Utah, introduced me to the single-leaf prints of Joerg Daxpach and Hans Sachs, a 16th-century meistersinger and poet from Nuremberg, Germany, and how woodcut pictures influenced the performance and reception of their songs about the Battle of Vienna in 1529. Hans Sachs works in the collection of the Staatsbibliothek zu Berlin have been digitized, so you don’t have to travel to Berlin to see them. Delphine Mercuzot, a stylish manuscripts curator at the Bibliothèque nationale de France, shared examples of digitized manuscripts of Roman de la Rose, a 13th-century poem. The images are accessible not only in the Roman de la Rose Digital Library, a joint project of the Sheridan Libraries of Johns Hopkins University and the Bibliothèque nationale de France, but also in Gallica, the digital library of the Bibliothèque nationale de France. Zoom in on individual pages of over 100 examples of the poem that are collected here. The conference also celebrated the centennial of the publication of Elias Avery Lowe’s The Beneventan Script, an important publication describing the development of a bold and beautiful calligraphic form of handwriting that was used in southern Italy between the 10th and 13th centuries. Lowe (1879-1969) was a Classical scholar who was recognized as the leading Latin palaeographer of his generation. His great-grandson is Boris Johnson, mayor of London. Hope Mayo, the Philip Hofer Curator of Printing and Graphic Arts at Harvard University’s Houghton Library, described the work on Lowe that was begun by Virginia Brown, a palaeographer who was Lowe’s research assistant during the last year of his life. Mayo presented highlights of Lowe’s career, particularly his graduate studies in Munich, Germany between 1903 and 1907. Sharing excerpts from Lowe’s diaries, Mayo described what a memorable experience this was for Lowe, especially as he studied palaeography at the home of paleographer Ludwig Traube between cups of hot cocoa and rounds of tennis. 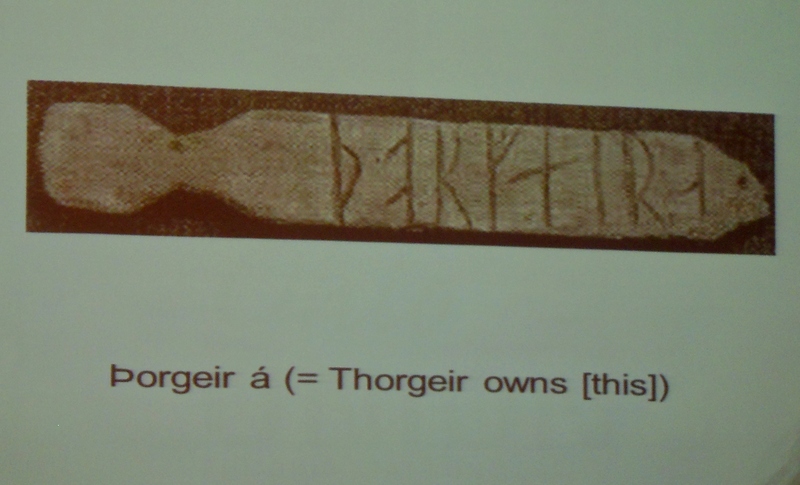 The workshop and conference were organized by not only Ohio State’s Saga Club, which offers events to encourage students’ interest in and learning of Old Norse-Icelandic language, literature, and culture, but also the Center for Epigraphical and Palaeographical Studies. As the only comprehensive research facility for the study of Greek and Latin inscriptions and manuscripts in the United States, the Center maintains a library of books on epigraphy and palaeography, an extensive collection of photographs and squeezes of Greek and Latin inscriptions, and a number of special collections, including Virginia Brown’s personal library and manuscripts on palaeography and Beneventan script. To watch “Language of the Stones,” an interesting video from the Center about epigraphy and squeezes (copies of inscriptions carved on stone which are retrieved for study by pressing damp paper over the lettering), click here. To read more, see The Paleography of Gothic Manuscript Books: From the Twelfth to the Early Sixteenth Century, by Albert Derolez; Gothic Manuscripts, 1260-1320, by Alison Stones; The Development of Flateyjarbók: Iceland and the Norwegian Dynastic Crisis of 1389, by Elizabeth Ashman Rowe; A Marriage of True Minds: A Memoir of My Parents, Helen Tracy Lowe-Porter and Elias Avery Lowe, and Other Writings, by Patricia Tracy Lowe; and The E. A. Lowe Papers at the Morgan Library and “E.A. Lowe and the Making of Beneventan Script,” both by Virginia Brown. This entry was posted in Art, Books, Ohio State University, Special Collections. Bookmark the permalink. 1 Response to Would Icelandic Scribes Have Illuminated A Block O With Crowberry Ink? The Chintz Room is one of my earliest memories. My mother took me there for special dates when I was growing up. My first visit was a special day, just we two, when I was six. It may have been my birthday. I had three boisterous siblings to contend with at home, so luncheon with my mother all to myself was a very special treat for a shy little girl like me. My mother, the great and marvelous Patricia Burns Carr, died last year. I would have loved one more visit to the Chintz room with her, but I was grateful today to spend the afternoon with you, remembering the many lovely moments of my youth. I’m looking forward to our next visit!